As expected, however, the gloves came off immediately thereafter, with a series of tough American demands, especially U.S. Secretary of State Hillary Clinton's insistence on May 27 that the Netanyahu government end residential building for Israelis in the West Bank and eastern Jerusalem. This prompted a defiant response. The Israeli governing coalition chairman pointed out the mistake of prior "American dictates," a minister compared Obama to pharaoh, and the government press office director cheekily mock-admired "the residents of Iroquois territory for assuming that they have a right to determine where Jews should live in Jerusalem." If the specifics of who-lives-where have little strategic import, the Obama administration's rapid and harsh turn against Israel has potentially great significance. Not only did the administration end George W. Bush's focus on changes on the Palestinian side but it even disregarded oral understandings Bush had reached with Ariel Sharon and Ehud Olmert. has revived a long-dormant Palestinian fantasy: that the United States will simply force Israel to make critical concessions, whether or not its democratic government agrees, while Arabs passively watch and applaud. "The Americans are the leaders of the world. … They can use their weight with anyone around the world. Two years ago they used their weight on us. Now they should tell the Israelis, 'You have to comply with the conditions'." Of course, telling the Israelis is one thing and getting their compliance quite another. 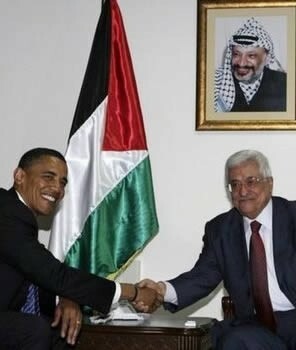 To this, Abbas also has an answer. Expecting that Netanyahu's agreeing to a complete freeze on building would bring down his coalition, Diehl explains that Abbas plans "to sit back and watch while U.S. pressure slowly squeezes the Israeli prime minister from office." One Palestinian Authority official predicted this would happen within "a couple of years" – exactly when Obama is said to expect a Palestinian state in place. Abbas rejects the notion that he should make any comparable concession—such as recognizing Israel as a Jewish state, which would imply renunciation of any large-scale resettlement of refugees. Instead, he says, he will remain passive. … "I will wait for Israel to freeze settlements," he said. "Until then, in the West Bank we have a good reality . . . the people are living a normal life." Abbas's idea of "normal life," one should add, is also largely provided by Washington and its allies; West Bank Palestinians enjoy by far the highest per-capita foreign aid of any group in the world; at just one "donors' conference" in December 2007, for example, Abbas won pledges for over US$1,800 per West Banker per year. As Diehl tersely concludes, "In the Obama administration, so far, it's easy being Palestinian." First, Netanyahu's governing coalition should prove impervious to U.S. pressure. When he formed the government in March 2009, it included 69 parliamentarians out of the Knesset's 120 members, well over the 61 mum. Even if the U.S. government succeeded in splitting off the two parties least committed to Netanyahu's goals, Labor and Shas, he could replace them with right-wing and religious parties to retain a solid majority. Second, the record shows that Jerusalem takes "risks for peace" only when trusting its American ally. An administration that undermines this fragile trust will likely confront a wary and reluctant Israeli leadership. If Washington continues on its present course, the result may well be spectacular policy failure that manages both to weaken America's only strategic ally in the Middle East even as it worsens Arab-Israeli tensions.